If I told you that there is an exercise that has been practiced for more than 5,000 years and includes benefits such as flexibility, strength, posture, breathing, concentration, less stress and more... would you know what I was referring to? Of course you would, it's the world-renowned way to build your body as well as develop inner peace for your mind: yoga. Even better, yoga is a completely customizable experience every time you roll out your mat. The only way to be certain of all that it can do for you is to try yoga for yourself and see. There are no special skills or talents required, you just need to be prepared with the right equipment - first and foremost a thick and durable mat from Aurorae Yoga. Like I said, no special skills required! Available in six soothing colors that help define your inner self (e.g. Ocean for caring, cooling and trustworthy or Infinity for strength, sophistication and professionalism), Aurorae Yoga Mats contain all of the features that make for a high quality yoga experience. The extra-long 72" length means that I can lay completely stretched out and not touch the floor and the ultra-thick 1/4" mat is softer and absorbs more impact than any that I have ever felt before. Instead of a thin piece of flimsy rubber, Aurorae Yoga Mats are amazingly padded and, although a strange analogy, almost make me feel like I am resting on a memory foam mattress topper rather than a yoga mat. While enjoying the luxuriousness of using a yoga mat that cushions your entire body, Aurorae Yoga has also come up with solutions to the common complaint of slipping while doing yoga. It is difficult to hold positions with sweat dripping down onto the mat, causing your hands or feet to slide out of place, right? Now you'll never have to move around again, thanks to their innovative Slip Free Rosin Bag and Yoga Sport Sweat Towel. The perfect size to fit in your hand, the Aurorae Yoga Rosin Bag increases gripping power and absorbs perspiration simply by touching it. I wondered if it would leave a powder or chalky feeling to my hands and feet, but in fact, it didn't. After barely holding it in my hand, I rubbed my fingers together and found that my hand felt drier (but not dried out) but still perfectly clean - no odor or sticky residue remained. As it comes in its own zip-close plastic bag, this Rosin Bag is easily transported in your gym bag or kept with your workout equipment at home to be brought out when it is time to do yoga. Apply a small amount before beginning and then keep the bag nearby for an extra dab when needed. For a little extra sweat removal, Aurorae Yoga's latest product is their Yoga Sport Sweat Towel, a 16" x 23" towel that fits right in to your yoga experience. Made out of 100% natural cotton soft terry, this is just the thing to pull out and use in conjunction with the Slip Free Rosin Bag to keep your yoga practice at its finest. Rubbing this towel on my forehead felt soft and refreshing! As well as offering only the highest quality products, Aurorae Yoga truly cares about your shopping experience. On the constant lookout for simple and cost-effective ways to help you improve and enjoy your practice, they strive to make sure you are completely satisfied with every purchase. If you ever have any comments or concerns, contact Aurorae Yoga and you will always be treated like a friend and not just a customer. I think that's something we can all appreciate. 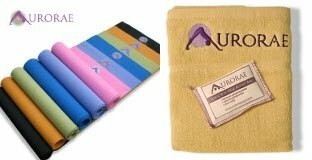 One lucky person will win an Aurorae Yoga Mat, Yoga Sport Sweat Towel and Slip Free Rosin Bag! ARV $43! To enter to win: Visit Aurorae Yoga, browse their products and tell me the name of the color of their high quality mats that is your favorite. Extra Entries (available after the mandatory entry above is completed; please leave a separate comment for each entry in order for them to be counted). 1 Extra Entry (per giveaway entered) - Enter any (or all) of the giveaways running on Thanks, Mail Carrier for the duration of this giveaway. 1 Extra Entry if you follow me on Twitter and tweet about this giveaway by copying and pasting the tweet below and leaving me the link. Tweet daily for an extra entry every day! 2 Extra Entries (per follow method) if you follow me with Google Friend Connect (see sidebar), subscribe to my RSS feed, subscribe to Thanks, Mail Carrier by email or Like me on Facebook. 3 Extra Entries if you put my cute button up on your blog. Please leave an address where it can be found. 3 Extra Entries if you blog about this giveaway linking back to Thanks, Mail Carrier and Aurorae Yoga. Please leave an address where it can be found. Giveaway will end on May 27th at 11:59pm CST. Do me the favor of leaving an email address or making absolutely sure it is visible in your profile, I have to have a way to contact the winner. The winner will be chosen by random.org and announced here as well as emailed and will have 48 hours to contact me or respond to notification or a new winner will be chosen. This giveaway is open to U.S. residents only. A big thank you to Aurorae Yoga for providing a Mat, Sport Sweat Towel and Slip Free Rosin Bag for me to review as well as for one lucky giveaway winner. The opinions shared are my own and honest and if you really need to see more, click here to see how I roll. I love Violet, but they are all quite pretty. I entered the ZooShoo giveaway. I entered the By Baby giveaway. I entered the KINeSYS giveaway. I like "infinity" the black mat. I like the violet yoga mat! Ocean is definitely my color of choice. I am now a twitter follower of Aurorae Yoga. I am now a facebook fan of Aurorae Yoga, and I posted the message on their wall. I Follow you on twitter, and I tweeted about your giveaway. I entered the EatSmart giveaway. I entered the Eleven giveaway. I really like the color Hope. I'm following AuroraeYoga on Twitter. I entered the Yoplait contest. I entered the KINeSYS sunscreen giveaway. I love the "Seamist" color! I "like" Aurorae on facebook! entered the digital photo keychain giveaway! entered the Sophisticated Baby giveaway! I think Hope is my favorite. I follow you on GFC 1. I follow you on GFC 2. I entered the CSN Stores Giveaway. I entered the Beso.com giveaway. I love "Seamist." Green is supposed to be a calming color, so count me in! I follow AuroraeYoga on twitter (name= @Ida_Sessions). I'm an email subscriber, which is how I discovered this giveaway. I would choose "Hope." I like the name and the color. How do contact lenses work? Are you a big winner? UpSpring Baby Mother's Day Giveaways!